Fairfield, Maine: September 2014 — Lauded by foodies as the "new kale," Kalettes® are the striking result of a non-GMO cross between kale and Brussels sprouts. Johnny's Selected Seeds is pleased to introduce the new Kalettes seed this fall to direct-to-market commercial growers and avid home gardeners across the US and Canada, under an exclusive partnership with Tozer Seeds. The launch of Kalettes is expected to generate strong demand from consumers and growers alike. With their appetizing visual appeal, delicate flavor, and powerful nutritional value, these versatile, conveniently-sized Kalettes will be 2015's must-have new vegetable. Direct-to-market commercial growers can be among the first to offer this exciting new kale–Brussels blend to restaurant chefs, specialty markets, local farmers' markets, and CSA customers. Kalettes develop in a whorl of tightly-spaced, brilliantly-colored rosettes on stalks of tall, upright plants, just like Brussels sprouts. The mature florets feature ruffled, purple–green petals with a mild, sweet-nutty flavor which only improves as the cooler, shorter days of fall give way to winter. Kalettes are suited to diverse preparation methods such as grilling, steaming, sautéeing, stir-frying, and roasting. Impressively, when lightly cooked they retain their unique coloration and plate appeal. Kalettes' three bicolor varieties are specifically slated for sequential harvest slots. 'Autumn Star' is first to produce for early season harvest, 'Mistletoe' for the mid season harvest slot, and 'Snowdrop' to meet late season demand. Plant all three for an extended harvest program. The early crop requires a minimum of 110 days to mature, from time of transplanting. "Kalettes grow best in cooler weather, especially when forming florets, but will perform well in areas with mild summer weather prior to floret formation," notes Steve Bellavia, Product Technician at Johnny's. "In areas with hot summers, the crop can be transplanted in late summer for successful fall, winter, and spring harvest." From seed to edible floret, total time requisite for crop production ranges from 15 to 19 weeks. The result of 15 years of traditional breeding work by Tozer Seeds of Britain, Kalettes has been extensively trialed across the United States. 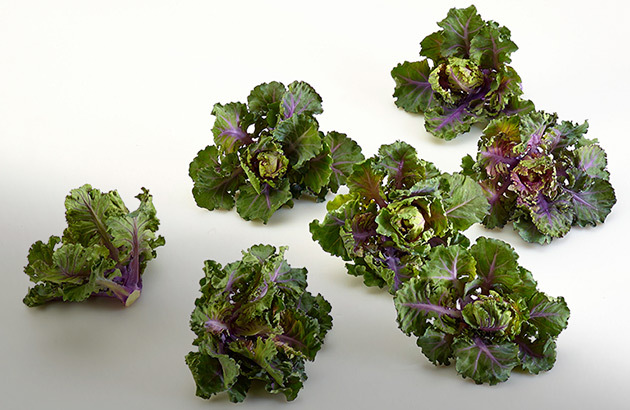 Johnny's Selected Seeds began trialing kale–Brussel sprouts crosses with Tozer as early as 2009 to help develop the advanced genetics of the new Kalettes strain. "Johnny's is proud to partner with talented breeders around the world to bring leading innovation to growers," states Lauren Giroux, lead Vegetable Product Manager at Johnny's. "Kalettes is just one such example of our ability to deliver fresh, cutting-edge seed varieties to growers looking to diversify their offerings." Kalettes seed will be available for purchase from Johnny's Selected Seeds on October 1st, 2014.